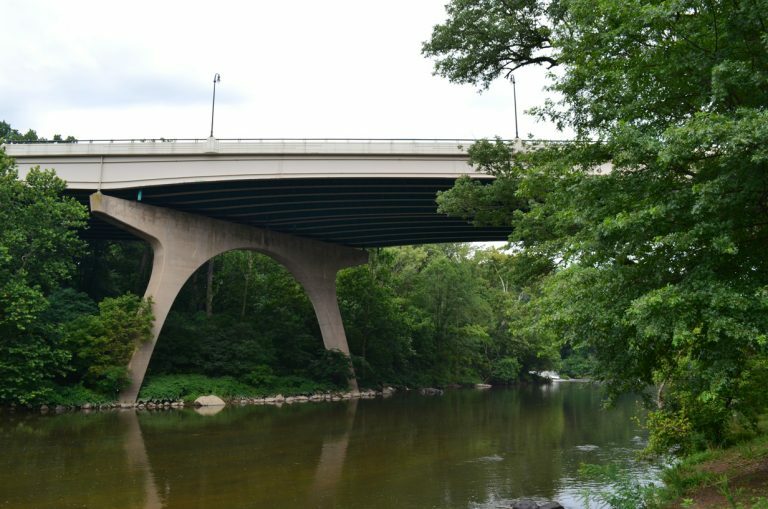 Interstate 95 crosses over Brandywine Creek and Brandywine Park just north of the Van Buren Street Bridge in Wilmington. Photos taken August 3, 2013. Interstate 95 enters Delaware from the vicinity of Elkton, Maryland along an east-west alignment originating from Baltimore. The initial 11-mile portion of I-95 in New Castle County doubles as the tolled John F. Kennedy Memorial Highway / Delaware Turnpike. Tolls are collected at a toll plaza in south Newark between the Otts Chapel and Welsh Tract Road overpasses. Delaware 896 (South College Avenue) meets Interstate 95 at one of two interchanges serving Newark and the University of Delaware. Forested frontage from there eastward shroud adjacent development to the Delaware House Service Plaza preceding Exit 3 with Delaware 273. The Service Plaza provides travelers with a food court, fuel station, truck parking and a tourist information center. Traffic counts increase with additional commuters joining Interstate 95 east from SR 273 as the Delaware Turnpike enters the busy exchange with Delaware 1 and 7 by Christiana Mall. The former full-cloverleaf interchange was redesigned to incorporate new flyovers between the freeways in conjunction with expansion of I-95 to ten lanes across Christina Marsh. The ten lane stretch takes I-95 north to the split with Interstate 295 ahead of the full cloverleaf interchange (Exits 5A/B) with U.S. 202 south and Delaware 141 (Newport Freeway). Four lanes carry through traffic toward the adjacent split with Interstate 495 north as I-295 veers eastward toward New Castle and the Delaware Memorial Bridge. U.S. 202 overlaps with Interstate 95 north from Delaware 141 for a shared route into Wilmington. Interstate 495 branches east to bypass the city while I-95 turns northward toward Browntown and Downtown Wilmington. The freeway traverses wetland areas along the Christina River before ascending onto the Wilmington Viaduct by Frawley Stadium and the Riverfront. The elevated roadway transitions into a trenched freeway at the Appalachian fall line between 4th and 5th Streets in Wilmington. Continuing north between the couplet of Adams and Jackson Streets, I-95 & U.S. 202 emerge from below grade at Lovering Avenue to span Brandywine Creek across a high-level six lane bridge. The freeway expands to six lanes with auxiliary lanes between Exits 7 (SR 52) and 8 (U.S. 202 / SR 202). Just beyond the city line, U.S. 202 parts ways with Interstate 95 north at a directional cloverleaf interchange with Concord Pike. U.S. 202 lines Concord Pike, a six-lane commercial arterial, northward to Delaware County, Pennsylvania while I-95 remains northeast through the Brandywine Hundred community. The remainder of Interstate 95 through northern Delaware carries four lanes with rural design standards. This stretch of freeway parallels a CSX Railroad line by a number of older subdivisions toward Ardencroft, Ardentown and Claymont. A wye interchange returns I-495 traffic onto I-95 north within a diamond interchange with SR 92 (Naamans Road) as the freeway approaches the Pennsylvania state line outside Marcus Hook. The first of three public workshops addressing safety issues along SR 273 at both Harmony Road and Interstate 95 was held on May 11, 2015. One alternative considered involves constructing a diverging diamond interchange (DDI) in place of the directional interchange with I-95. Work starting in 2016 at Exit 5 with SR 141 includes a new ramp from Basin Road north to Interstate 295 and a relocation of the ramp from I-295 south to SR 141 north to make more of a sweeping curve. The four overpasses carrying SR 141 across I-95 will be replaced and the loop ramp from SR 141 north to I-95 and 495 north will be expanded to two lanes. The first section of Interstate 95 within the First State opened to traffic on November 15, 1963. The Delaware Turnpike extended east from Maryland's Northeast Expressway to the Delaware Memorial Bridge freeway (U.S. 40). Initial toll rates levied on passenger vehicles were set at 30 cents at the main line plaza.2 Ramp tolls at a rate of 10 cents per passenger vehicle were collected at SR 896 (Exit 1), SR 273 (Exit 2) and SR 7 (Exit 4) by coin drop basket. The Delaware Turnpike main line toll plaza partitions traffic between four high speed E-ZPass lanes and 14 booths (seven per direction) collecting cash tolls. All passenger vehicles were levied a $3.00 toll until October 1, 2007, when rates increased to $4.00. Photo taken June 6, 2012. Early 2000s discussion involved implementing tolls at Exits 1, 3 and 4. The state debated the idea of a potential public/private partnership in which private money would be used to help cover the costs of rebuilding the failing interchanges. 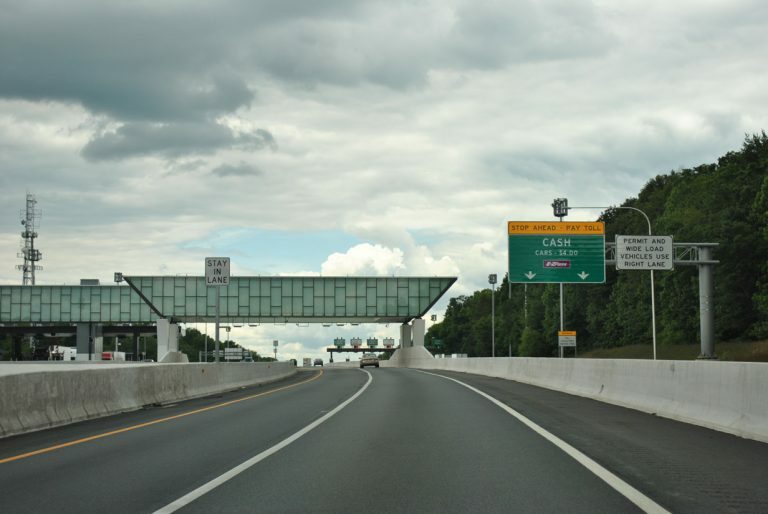 Tolls in turn would compensate private investors for funding infrastructure improvements. The proposal was preliminary and never implemented. A minor improvement at Exit 1 involved repaving of the existing ramps and smoothing of the flat area from the former toll booths on the northbound on-ramp from Delaware 896 north to Interstate 95 and heightening the curb and retaining wall on one of the loop ramps. This project was undertaken between June and fall 2007. Exit numbers for Interstate 95 use a sequential based system. There is no Exit 2 however. The number was reserved for an interchange planned midway between SR 896 (Exit 1) and the Delaware Turnpike Service Plaza near Chapman Road. 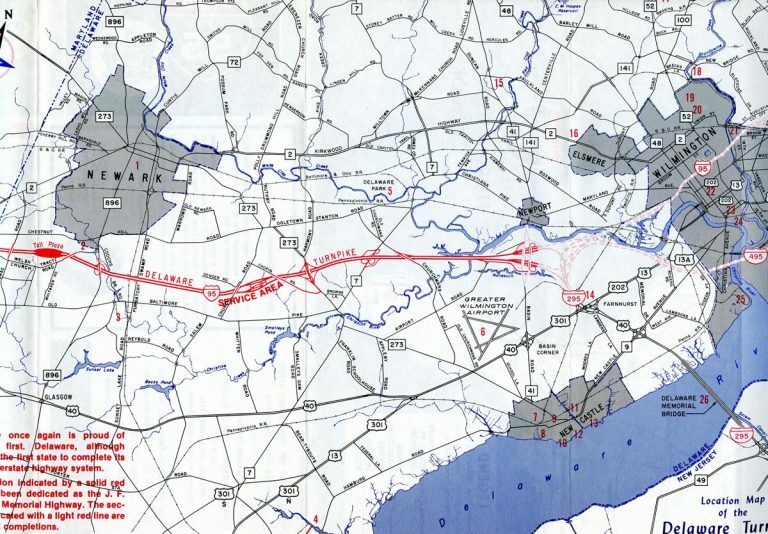 During the 1960s and to the 1980s, a north-south freeway was planned along the U.S. 301 corridor between Middletown and Newark. The limited access highway was to travel northward from the Summit Bridge over the C & D Canal to Interstate 95 at Exit 2. North of I-95 as the Pike Creek Freeway, the alignment extended to Delaware 2 (Kirkwood Highway) at Upper Pike Creek Road and Delaware 7 (Limestone Road) by way of Linden Hill Road. Although long since canceled, DelDOT retained several parcels of undeveloped land along the reserved right-of-way. The project was still included within the 2010 25-year plan9. A directional cloverleaf interchange connects Interstate 95 and Delaware 273 (Christiana Road) at Exit 3. Originally a simple diamond, the exit was expanded with two directional ramps and two loop ramps in 1976.10 A toll plaza once operated on the northbound on-ramp. The wide shoulders along that off-ramp today allude to the former toll booths. The subsequent northbound exit with Delaware 7 (Exit 4) consisted of a partial access interchange until 1976.9 A single off-ramp served movements from I-95 south to SR 7 via Churchmans Road (SR 58) west while a loop ramp connected I-95 north onto SR 7 north only. Additionally there was no southbound ramp from SR 7 north; instead motorists were directed onto SR 273 west from Christiana to access the turnpike. Work finally commenced in 2011 when an $111.9-million contract was awarded on July 6. The winning bid was $34 million lower than revised DelDOT estimates with a time table 14 months shorter.13 Improvements here also expanded Delaware 1 north with a new flyover shuttling drivers onto the left-hand side of Interstate 95 north for the split with I-495 while adding a single lane ramp from the right to the right-hand side of I-95 for Interstate 295. Interstate 95 north plies across Christina Marsh to the split with Interstate 295. A $51.9 million project widened the freeway here to ten overall lanes with 12 to 14 foot shoulders here between 2007-08. Photo taken October 5, 2014. 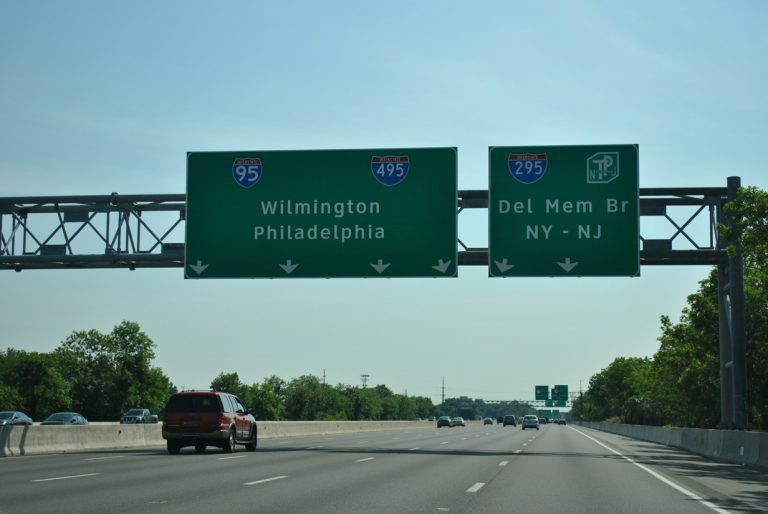 The Delaware Turnpike ends at the Interstates 95 & 295 split and junction with Delaware 141 (Exits 5A/B). Delaware 141 travels along an elevated freeway north from I-95 through the city of Newport to Delaware 2 (Kirkwood Highway) at Prices Corner. 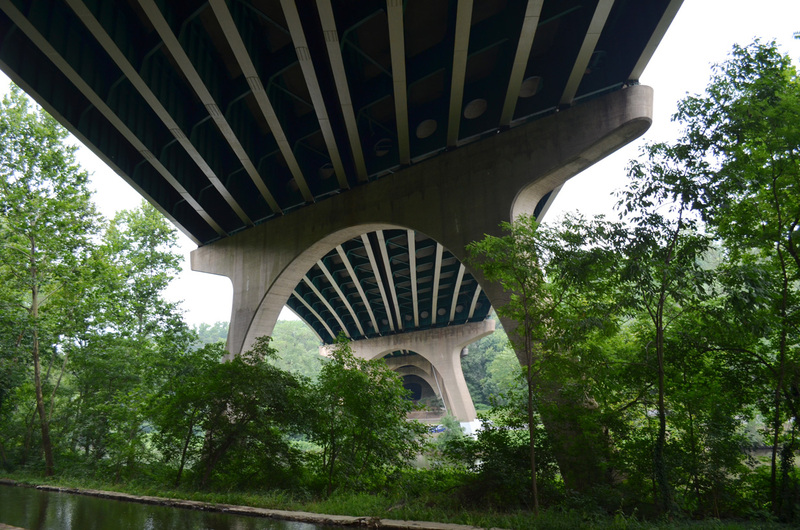 The freeway was constructed in the late 1970s to replace a surface route of Delaware 41. South from I-95, U.S. 202 was added along side Delaware 141 (Basin Road) as part of a realignment approved by AASHTO on December 7, 1984.17 U.S. 202 overlaps with SR 141 north from U.S. 13 & 40 at Wilmington Manor to I-95, and along side I-95 to Exit 8. Exit 5 is unusual in that it involves four different roadways (Interstates 95, 295, 495 and U.S. 202 & Delaware 141). The interchange or "megachange" as we refer to it, encompasses a substantial amount of acreage. Left-hand ramps and weaving traffic patterns remain a problem at the junction, and future work will address some of these issues. A 1999-2000 project involved the redecking of the Delaware 141 overpasses over Interstate 95 & 295 and the repaving of several of the associated ramps. The project coincided with a major resurfacing and resigning project of the Newport Freeway between 1997 and 1999. Construction started in early 2016 addresses several of the ramps associated with the cloverleaf interchange between Interstates 95 and 295 with SR 141. Geometric improvements are underway along ramps between SR 141 and I-95 southbound, and from SR 141 south to I-295 north. Work is also expanding the loop ramp from SR 141 north to I-95 north to two lanes beyond the merge point with the ramp from SR 141 south. Additional construction adds a new ramp from SR 141 north to I-295 north while a realignment shifts the ramp from I-295 south to SR 141 north to a new ingress point. See the SR 141 and I-95 Ramp Interchange Project web site for more details. North of the partition with Interstate 295, traffic separates again at the wye interchange with Interstate 495. Opened in 1977, I-495 provides a six-lane bypass of Wilmington as the preferred route to Delaware County and Philadelphia, Pennsylvania. 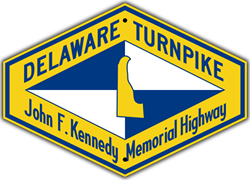 Brochures were published in the 1960s for the Delaware Turnpike. The toll road defaulted onto the I-295 freeway leading toward the Delaware Memorial Bridge until completion of the Wilmington Expressway. The Wilmington Viaduct takes Interstate 95 above AMTRAK's Northeastern Corridor and the city street grid to the West Side neighborhood. The elevated roadway opened to traffic as part of an extension of I-95 north from the Delaware Turnpike to Seventh Street in 1967.22 The bridge system underwent major reconstruction between 1979 and 1982. The prolonged road work resulted in the temporary renumbering of I-95 east onto Interstate 495 and the creation of Interstate 895 along the original I-95. The project also included a relocation of the northbound off-ramp to SR 52 (Exit 7) two blocks northward from Seventh to Ninth Streets. Building a directional T interchange between the Riverfront and Interstate 95. Developing a new northbound only exit roadway from the riverfront area from South Madison Street. Madison Street would become a one-way southbound street to coincide with the new road. Extending Terminal Avenue (Delaware 9A) west to U.S. 13 across a new harbor. Construction of a new Christina River crossing to link South Madison and South Market (U.S. 13 Business) Streets. Interstate 95 north previously ended at the Delaware Avenue off-ramp between Sixth and Seventh Streets in Wilmington.2 Also referenced as the Adams-Jackson Freeway, for the two streets I-95 parallels, the remainder of the route through Wilmington was controversial due to the displacement of area residents and separation of the Cool Spring-Tilton Park and Trinity Vicinity neighborhoods in 1964. The long-term vision also included the creation of an urban corridor between West Second Street and Lancaster Avenue (Delaware 48) with light rail and widened roadways, changes to the Christina River waterfront and the Seventh Street Peninsula, and a redevelopment of the area bounded by Eighth, Ninth, Madison, and West Streets.19. This Interstate 95 proposal however never gained traction. Interstate 95 through the Wilmington underwent another major face lift in the early 2000s. All of the associated overpasses and bridgework were repainted and structurally repaired. The landscape of the trenched freeway between Adams and Jackson Streets was also improved between 2003 and 2004. Existing shrubbery was removed and replaced with new trees and ground cover. 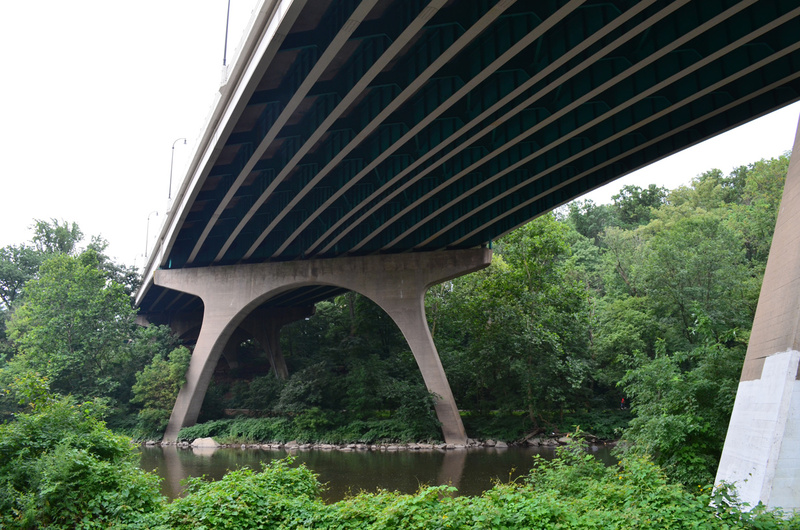 The Brandywine Creek Bridge, with initial construction commencing in August 1962,2 crosses high above the scenic creek and park between Shallcross Avenue and 18th Street. The six-lane span includes auxiliary lanes running between interchanges with SR 52 (Exit 7) and SR 202 and the departing U.S. 202 north (Exit 8). As part of the early 2000s improvement project for I-95, the bridge over the Brandywine River was retrofitted and adorned with new decorative lamps and aesthetic improvements including cursive "W's" inscribed onto the sides of the span. The protective screens on the four lane viaduct through the Browntown section of the city were replaced with cream colored fences also adorned with the cursive "W" for Wilmington. A $27.61-million project20 rebuilt the directional-cloverleaf interchange with U.S. 202 (Concord Pike) north and Delaware 202 (Concord Avenue) south near Blue Ball. Improvements of the project included construction of a new directional ramp from I-95 north to U.S. 202 with two lanes and a full shoulders. Work also removed the loop ramp (Exit 8A) from Interstate 95 south to Delaware 202 south to accommodate a new two-lane ramp from U.S. 202 south onto I-95 south. A new left-hand turn was added to Exit 8B for SR 202 south from I-95 south. This project was completed in November 2014. This work was preceded by a previously modification of the Interstate 95 northbound off-ramp to Delaware 202 south completed in 2004-05. That added a traffic signal to Delaware 202 south for drivers destined for the left-hand turn onto Broom Street north from Concord Avenue nearby. Interstate 95 opened to traffic from Delaware 3 (Marsh Road) northward into Delaware County, Pennsylvania following a ceremony attended by government officials from both states in Upper Chichester Township on the morning of November 1, 1968. The freeway initially opened with one lane in each direction while final construction on a bridge between Talley and Shipley Roads and guard rails work continued for another three weeks.22 This same stretch of freeway underwent reconstruction in 2000 when sections of I-95 were closed between Exit 8 and Interstate 495. Contractors rubbilized the 1960s concrete roadway to form a new base for fresh asphalt while allowing for additional clearance under several low overpasses. All bridges were repainted as well. During the project one direction of the freeway closed at a time for a three month period. The partial closure sped up construction, allowing crews to finish the six month project three weeks ahead of schedule in October of 2000. 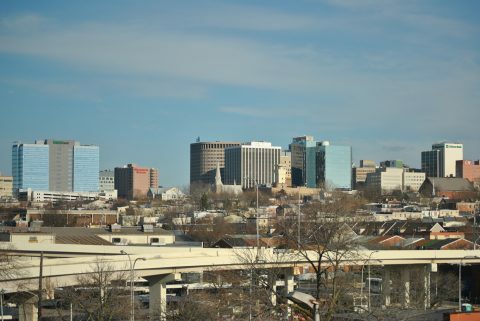 During the late 1990s a proposal arose to redesignate Interstate 95 through the city of Wilmington as Business Loop Interstate 95 and Interstate 495 east of the city as the Interstate 95 mainline. 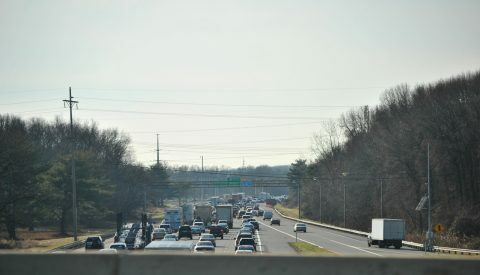 It was thought that switching the designations would shift the bulk of through traffic currently using Interstate 95 onto the six-lane bypass. Concerns for traffic congestion related to the 2000 reconstruction of the freeway north of Wilmington added fuel to the concept. 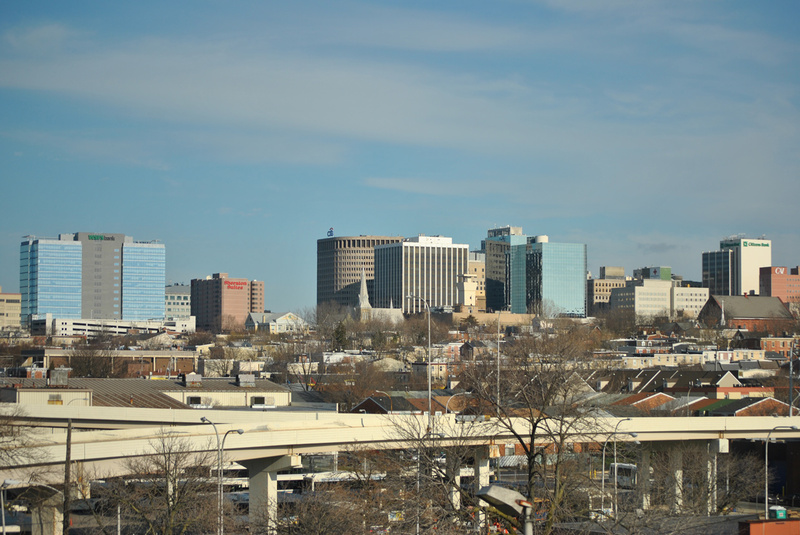 However Wilmington city leaders and local area politicians lobbied against the concept insisting that the Interstate 95 mainline remain near Downtown rather than bypass it altogether. Nothing has ever come of the proposal and Interstates 95 and 495 remain in tact. In 1992 Through Traffic and Local Traffic placards were installed on the Interstate 95 & 495 guide signs at the respective splits north and southbound. The 2000 reconstruction project included the placement of new guide signs on Interstate 95 northbound at Interstate 495 northbound. New panels no longer reference the local and through traffic applications of the freeways. The PennDOT signs however still retain the placards. Another proposal that briefly surfaced during January of 2000 was to renumber Interstate 95 in Wilmington as Interstate 195, and Interstate 495 as I-95. New Castle County Council contended that the renumbering would further encourage through traffic to use the eastern bypass of Wilmington. The planned reconstruction and nearby road work at Blue Ball (U.S. 202, SR 141 and SR 261) garnered additional support to the concept. New Castle County Council also contended that expansion of the Astra-Zeneca site at Blue Ball and the additional 1000+ jobs it created would cause traffic grid lock on Interstate 95. Those expectations were never realized and Interstate 95 remained in place. The main entrance of the Delaware Welcome Center Travel Plaza. The new facility opened for business in June 2010. Photo taken 06/26/10. Commemorative trailblazers for the Delaware Turnpike were posted at the Delaware Welcome Center Travel Plaza in 2013. Photos taken 08/03/13. Guide sign for the return ramp to Interstate 95 north from the Delaware Welcome Center Travel Plaza. Photo taken 06/10/12. Flyovers separate from Martin Luther King, Jr. Boulevard west to Interstate 95 on the Wilmington Viaduct. Photo taken 12/22/12. Harvey Road east at the southbound entrance ramp to Interstate 95 from Ardencroft. Photo taken 12/28/12. "TRAFFIC ALERT - I-95 Speed Limit Increases in Delaware." DelDOT, Press Release, May 13, 2015. "I-95 in Delaware linked East Coast, divided city of Wilmington." The News Journal (Wilmington, DE), November 14, 2013. "DelDOT to revisit slashed projects." The News Journal (Wilmington, DE), June 5, 2005. "State budget raises taxes, tolls and fees." The News Journal (Wilmington, DE), June 21, 2007. "State decides on fix for I-95 traffic." The News Journal (Wilmington, DE), May 11, 2004.
jfk_mem_hwy_improvement/newarktoll-i95/overview.shtml, JFK Memorial Highway Improvement Program (DelDOT). American Recovery and Reinvestment Act (ARRA). DelDOT web site. Taber, John. "Re: DE I-95 Public Workshop." Online posting. misc.transport.road, November 26, 2003. Weaverling, Ken. "Re: DE I-95 Public Workshop." Online posting, misc.transport.road, November 26, 2003. Weaverling, Ken. "Re: DE I-95 Public Workshop." Online posting, misc.transport.road, November 25, 2003. Weaverling, Ken. "DelDOT i95 workshop report." Online posting, misc.transport.road, December 2, 2003. "I-95 plans unveiled." The News Journal (Wilmington, DE), December 3, 2003. "Contract cuts cost, time of I-95 project." The News Journal, July 7, 2011. "Flyover ramp from SB I-95 to Del. 1 opens Tuesday." The News Journal, August 22, 2013. "New ramp from Del. 1 to NB I-95 opens." The News Journal, October 17, 2013. 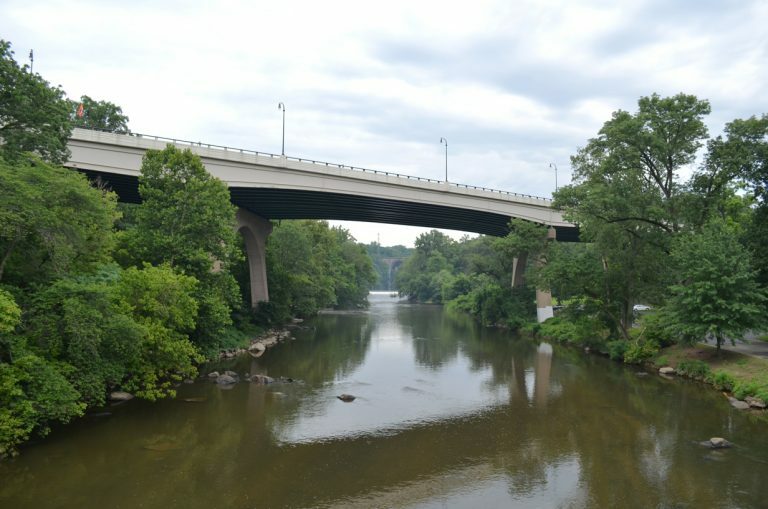 "Churchmans Road bridge over I-95 completed." The News Journal, December 8, 2006. "Riverfront ramps face more hurdles." The News Journal (Wilmington, DE), July 1, 1995. "Vision for Wilmington: Deck over I-95." The News Journal (Wilmington, DE), May 12, 2004. "Middletown company wins bid for I-95-U.S. 202 project." The News Journal, September 27, 2011. "Interstate 95 in Delaware: Timeline of its history and future construction." The News Journal (Wilmington, DE), October 12, 2018. "Think your commute is bad now, wait until Wilmington I-95 project starts." The News Journal (Wilmington, DE), October 9, 2018.